March 13, 2016: Article updated for 2016 scoring changes. Here is the DraftKings Fantasy Scoring system explained and a little basic strategy for the 2016 MLB season. DK’s Fantasy Baseball scoring is not unusual or exotic, just a Plain and Simple system that all fantasy baseball players know and understand. Like all Baseball point systems–big scoring nights by multiple players will put your line-up over the top in your league. On DraftKings, you start with a $50,000 Payroll / Salary cap for your roster. Your 10 roster Positions will have an average of $5K per position required. Rosters will consist of 10 players and must include players scheduled to play in at least 2 different MLB games. Rosters must have no more than 5 hitters from any one MLB team. No More 1B/DH position, whatever the natural (most often played) position for a real life DH is, is where he can be played on your line up. There are no negative stats for hitters this year, the Caught stealing penalty of -2 has been eliminated. Players lock at first pitch of each players game, changes can be made up until that time. *NOTE: Hitting statistics for Pitchers will not be counted, and Pitching statistics for Hitters will not be counted. DraftKings Baseball Scoring is weighted more towards Pitching. A Power Hitter that has a 3 for 4 night with a Home run, 2 singles, 2 Runs, 3 RBI’s and a walk = 3+3+4+6+10+2= 28 points scored. You basically want your hitters to get as many at bats as possible (top of the order players), there is no penalty for going hit-less or for caught stealing. Now, Compare those scores by batters, to a great and a okay start by a starting pitcher. A starting Pitcher who gets a complete game shut-out with 9 K’s, 2BB and 3 hits against will score 4(win) +20.25(IP) +18(K’s) +2.5(CG) +2.5(CGSO) -1.8 (BB) -1.2 (hits) for a score of 40.75 points. Since you have 2 starting pitchers in your line-up, this will make picking pitchers who will get solid performances the key to most winning line-ups. The high point potential of SP’s are why they are also the most expensive players listed. You’ll want to start one premier (higher salary) pitcher and one mid priced starter against a weaker hitting team. Using 2 premier starters will usually cost you 40% or more of your salary cap and hurt your hitting scores (fewer top name hitters). You want to find a nice balance for your SP’s (one High-one Mid to Low). Use the split stats for the pitchers you are considering, you can see their history against that particular opponent that night. You also don’t want to take just any hitters for your teams either. Successful fantasy players stack their line ups with multiple hitters from teams facing sub par (Bad) pitching teams or are playing in the smaller, home run friendly / high scoring ball parks (like Colorado, Boston, Chicago). Use the individual player cards for detailed split stats for batters against the team they are going against that night. These hitters don’t always have to be all the Big Name (High Salary) players either. If you play 3 or 4 hitters (with one high salary slugger) from a team like Toronto and the Blue Jays score 12 or more runs that night, you’ll pile up plenty of points from your all players on their hits, walks, runs scored and RBI’s. Stacking your teams like that, will score a lot of points when you find the right match-ups. Get your your first contest entry FREE when you join DraftKings and make any deposit……. The DK player listings always include OPRK, this is opposition rank vs. that position. If the OPRK is green that means that match-up is favorable to that player and should perform very well that night. If the OPRK is red, that means it is not a real favorable match up and that player may perform below his season averages. Use the OPRK every time you set a roster. Don’t overspend on a catcher. Most can’t hit that well and should always be a minimum salary guy. Your UTIL spot is best used on a first or third baseman or 3rd or 4th place hitters on MLB team line ups. This should be your best hitter of the day, it is the easiest choice to make because you are not limited to filling a specific position with this roster spot. 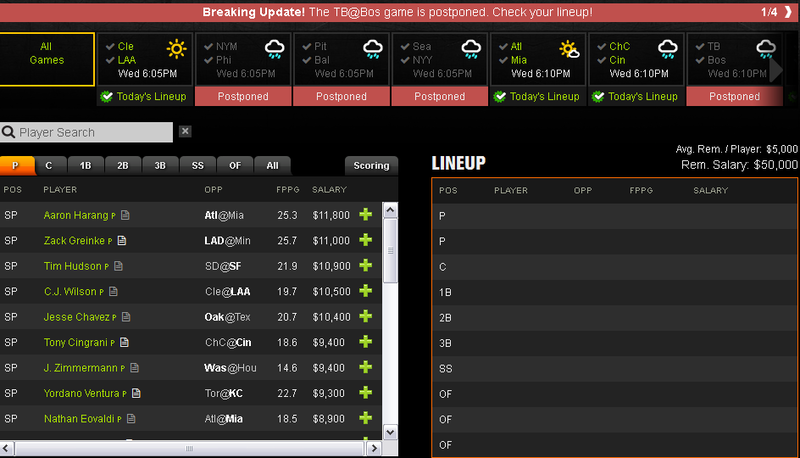 Individual game line ups will be shown (when made available) on the MLB game slate at the top of the Draftroom on DraftKings (see next image). Make sure your selected players are in their teams line up that night. If he sits you don’t score any points. Always investigate any injury notation by any players you are considering using that day. If he sits you don’t score any points. Use the Daily Vegas MLB Lines to help you find the best mis-matches. Stack the batters of heavily favored teams and key on games with the highest run totals for the day. Use the DraftKings Playbook (found on the main DK lobby) for daily player selection advice, match-up information, line up strategy and current player injury news. Clicking a individual players name will show their profile, season statistics, split stats, game log and any news / injury updates. DraftKings gives you everything you need to compete, it’s up to you to get started. 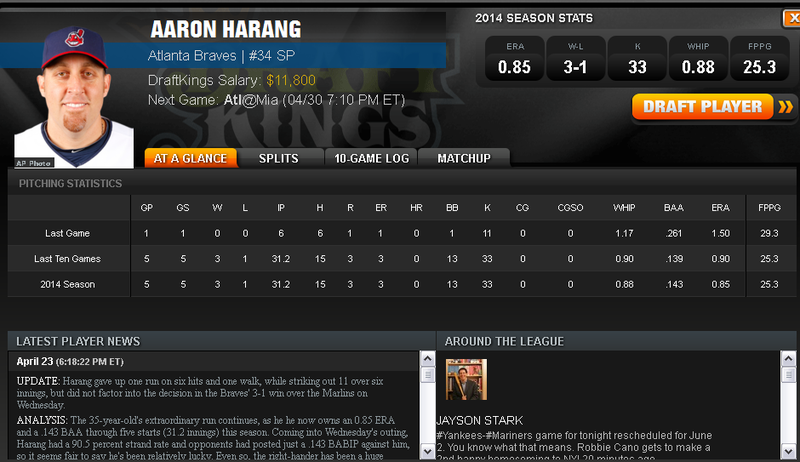 Be sure to check out the DK PlayBook as the MLB season starts to set your first line up and as the season progresses. Playing daily Fantasy Baseball is not expensive either, you can play for as little as 25¢ or $1 and have all the excitement you can handle thru-out the entire summer of Baseball. DraftKings has a full lobby of MLB Contests ranging from simple 2, 3, 5 and 10 team daily leagues and nightly tournaments with prize pools into the $10’s or $100’s of Thousands.